Are you resting back on your sofa? Know what you are losing by delaying in the investment! After observing the investment behavior of the mass, it has been noticed that most of the people invest too late and too little. They take investing serious when they feel their requirements for money are getting bigger. For instance, a person started retirement planning at the age of 50 when he had nothing much to save and invest. That is how most of the people are behaving when it comes to investing. Growth: If you start your SIP of Rs. 5000 per month at the age of 30, then it would grow up to Rs. 3,50,49,103 in the next 30 years at an expected return of 15%. It means at the age of 60, you would have more than rupees 3.5 crore from your investments. On the other hand, if you start late, say at the age of 50, and need the same corpus for your retirement life, you need to invest a very big amount in monthly SIP which is not normally possible for an adequately salaried person. Here, you lose the excellent benefit of an early start because of starting late. Moreover, you need to park more money in your SIP to attain a healthy retirement corpus due to starting late. Risk Intensity: Risk is everywhere. Less or more, it lies in all task of our life, be it business, job, or mutual fund investments. There are ways to reduce the risk, but none can get rid of them completely. The risk of investment in mutual funds is already very low when you invest in conservative nature of funds. Moreover, the liquid funds are known to be completely risk-free. However, if you wish to earn higher returns, then you need to invest in aggressive nature funds, i.e., equities. However, they carry higher risk, that can be minimised if you start investing early. 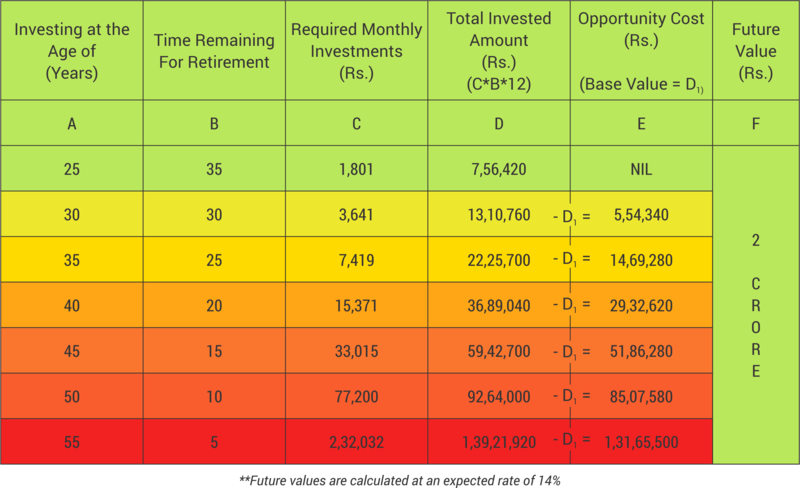 In mutual fund investments, the risk intensity gets reduced to the minimum as you extend the tenure of your investments. It means the longer you stay invested, the stronger the surety of profits gets. But unfortunately, if you start late in investing, then you will not be able to fetch this benefit. Surety of Profits: When you start early, your investment gets a longer period to roll into the market. In the long-term period, the surety of profits on your investment gets increased. Moreover, during the longer stay, your investment earns interest on interest which is popularly known as ‘Power of Compounding.’ It is one of the best benefits of SIP investment. It allows your money to increase the earning each period by multiplying the value. So, the longer you stay invested, more benefits in terms of ROI you get. Regretfully, you will not be able to fetch this benefit too, if you start investing late. Opportunity Cost: In general terms, an opportunity cost is a value at the cost of which you choose the other option. More simply, it is the benefit that you could have received but gave up to choose another substitute. In mutual funds, opportunity cost can be defined as the amount of investments that you need to put extra because of starting late. So, you can see that how your opportunity cost gets higher as you delay your investments. You can effortlessly build the required corpus of Rs. 2 crores by investing Rs. 1,801 monthly in SIP of suitable mutual funds, if you start at the age of 25. But, the cost of investment gets higher and higher when you start late. Thus, in the table, you can see that you need more amount to invest as you delay your investment. The opportunity cost in the table is calculated keeping the investment amount in the first column, i.e., Rs. 7,56,420, as the base value. Henceforth, do not let the burden of investments increase just because of not taking it seriously now. Time is the biggest gift you can ever have. If you have it now, then don’t wait for tomorrow and start your investments right away. You can easily build a big corpus for your future by investing small amounts through SIP. Else, it would become very difficult and next to impossible to attain the required corpus if you start at the extreme age such as fifty or fifty-five, because investing Rs. 75,000 or Rs. 2,30,000 monthly is quite impractical. Get the best mutual funds which have proved their potential of generating higher returns in the long-term period. We, at MySIPonline, look forward to serving you with the best to make your entire investment journey an effortless process.